Why does the sky turn a strange color before a tornado? One warning that a serious storm or a tornado is approaching comes from the color of the sky. 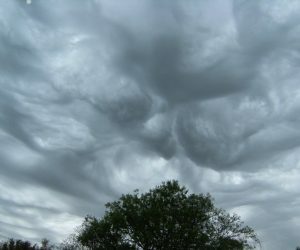 A reader’s question about changes in sky colors before a storm. No one knows for sure – but there are a couple of theories about that weird greenish-yellow color you see before a storm. Storm clouds themselves may help make the color green — or the storm may just act to provide a dark backdrop, so that you can see the color. Here’s one idea. You know how mountains in the distance look a deepening blue. That blue color stems from the scattering of light by air molecules — it’s the same reason the sky looks blue. In one theory on green thunderstorms, a golden-reddish light from the sun low in the sky — and a natural bluing effect of the air — combine to create the green sky. The other theory about green skies during a storm has to do with the fact that water is intrinsically blue. Sometimes you can see the bluish tint of water in a white bathtub. It could be that the storm clouds provide the color blue — which again is illuminated by the golden light of a low sun to create the color green. So the reason for green skies before a storm isn’t entirely known. But it is known that a greenish-yellow sky before a storm is common in some parts of the country — while totally absent in others.